of Santa Cruz County, Inc.
EVERYONE in our community COUNTS! 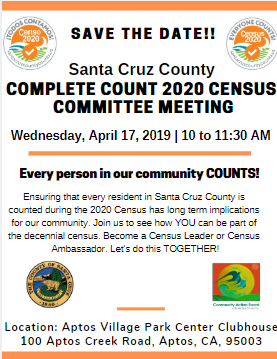 Ensuring that every resident in the County of Santa Cruz is counted during the 2020 Census has long term implications for our community. 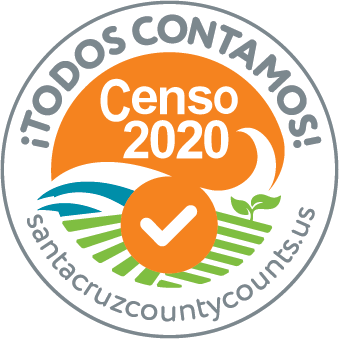 CAB and the County of Santa Cruz are working together to ensure that all individuals are included in the decennial census. There are many ways to become involved in this large scale effort. VOLUNTEER! If you are interested in learning more or would like to become involved in volunteer census work, please fill out our general Interest Survey which can be found here. FOCUS GROUPS CAB and the County of Santa Cruz are hosting a series of focus groups to get community input on how to develop a successful strategy for reaching all members of our community. To sign up for our April 17 meeting in Aptos, click HERE for more information. LEADERSHIP If you are interested in assisting in a volunteer leadership capacity, please see our signup form here. More information will be posted soon! Follow SC County Census on Social Media, and spread the word! Copyright ©2019 Community Action Board. Education Zone by Rara Theme. Powered by WordPress.